I knew my trip was all about escape. 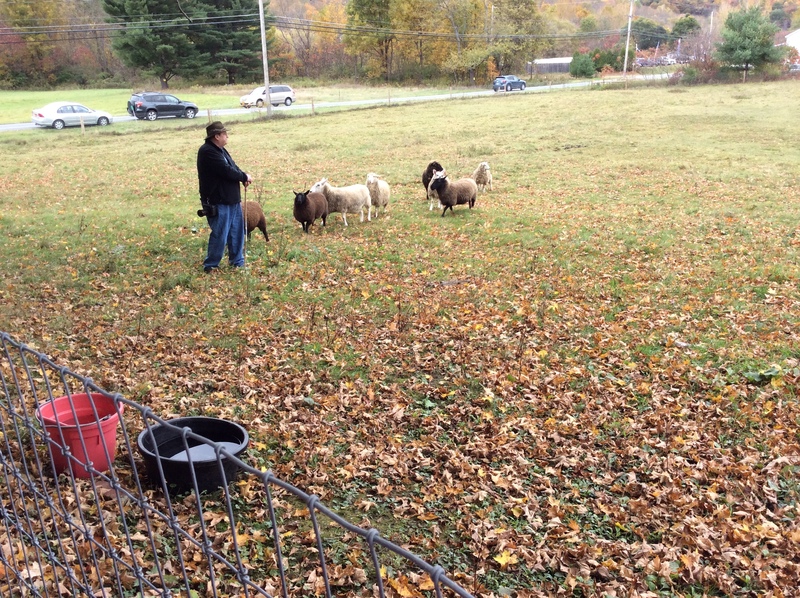 For the past two years, each October, I’ve flown across country to Cambridge, New York to join online creative friends at author Jon Katz’ Bedlam Farm. Each time I would leave behind my parent’s aging house on acreage, bills and piles of junk and memorabilia they had packed into the house. I also left behind my father, who was slowly fading away in a nursing home. The rubble and problems associated with each consumed my life. The trips took me into the unknown. Although New York is my home state, Cambridge and upstate New York was new to me. I was always aware that travel invites risk, stepping outside boundaries, responsibilities and expectations. But really, as I sat in the rented Ford Prius at the small Albany Airport, I knew my trip was all about escape. At that moment, no one knew where I was, only where I’d been. As I headed north away from the busy city and headed into the open green farmland, my cloak of invisibility deepened. Perhaps the rental car had a GPS marker, I wondered. Certainly, my cell phone was GPS enabled. But once parked and the cell phone left behind, I could step away, untraceable. It was an impossible thought but one I pondered. Parked behind the Round House Bakery Cafe in the quint town of Cambridge, I felt something different, foreign. The scent of cinnamon drifted from the café into my car’s window, calming me. I stepped out of the car into the cold wind and smelled the scent of manure on distant pastures, decaying leaves and perhaps apples that had fallen on the ground, also decaying back to the earth. Something was pulling me, speaking to me to stay, be reborn, to be part of life again. Dizzy, I leaned against the car. Perhaps I was only hungry and I stepped away to enter the restaurant and had a hearty country breakfast. Afterwards, driving north on Highway 22, it wasn’t long before I saw Bedlam Farm, a line of cars already parked in a row on the side of the road, inches from the white line and zooming traffic. I pulled alongside the last car and looked over at the pasture. There was author Jon Katz working his two Border Collies, Red and Fate, moving the small herd of sheep. I imagined Red staring eye to eye with the stubborn creatures, his lungs expanding and contracting after his outruns; his aging legs feeling rejuvenated from the exercise. To the right I saw Jon’s wife, Maria, with her brown mountain pony and felt the animal’s impatience as it was torn between eating carrots and apples or trotting in the far field in the cool air. Then I saw their grey and tan cat, heavy after a breakfast of fresh mouse or in her case mice, as she had the fortune of killing not one, but two. All this I saw and sensed as I sat in my parked car in front of the 1880’s farmhouse. Closing my eyes, I also imagined the original inhabitants of the house, a former schoolhouse, and imagined barns filled with horses. I felt life, something I hadn’t felt in a long time, as the tedium of simply “being” overwhelmed any zest for actually partaking of life. Why is it we only feel that zest when we are young? It was then I knew that there would be no trip back to dullness and my own ever-increasing slide to old age. That was it really. No one knew where I was at that moment. Until I walked down the farm-house driveway and joined my fellow “Creatives” I was still invisible. This was a turning point and I felt exhilarated, although mystified as to how to make a change. NOTE: Each time I have driven around the countryside while visiting the Bedlam Farm Open House, I’ve shocked myself with the realization that no one knew exactly where I was the entire trip. Then as time went on I wondered how people vanish into thin air. Where do they go? Is it possible they go back in time, back to a simple, more moral life where work is hard and food is home-grown and people talk to one another face to face? What if? This entry was posted in Bedlam Farm, Jon Katz, Short Story and tagged Bedlam Farm, Cambridge, Jon Katz, Maria Wulf, New York, Short Story, time. Bookmark the permalink.